THE NATURAL HAVEN: Can a Boar Bristle Brush Damage Hair? Can a Boar Bristle Brush Damage Hair? I did not really have to do any research to answer this question but I did anyway because I an insatiable appetite for it! Any tool, from your fingers, a wide tooth comb, a fine tooth comb, a denman brush or boar bristle brush can damage your hair if used incorrectly. It is completely inaccurate and misleading of Kent Brushes to say that as a brush is made of keratin, it will never damage hair. Boar bristle brushes are known for being stiff and uneven in length. Some people can use them all over the head but others just keep them for final smoothing of edges only as they find them too rough for all over use. Many naturals opt out all together. I would say, try the boar bristle brush on a small section of hair and make a decision for yourself whether your hair can take it or not based on if your hair breaks or splits afterwards. Also there are some who do the water only technique without brushing, just have a look on youtube. Erm, no there were no scientific papers on specific brush types and hair damage. I did, however, find a paper way back in 1958 that essentially said the kind of brushes that are common place now - nylon brushes - are evil. Ok, ok, it was not literally that but I do like the style of writing back then, it is very different to the technical writing that I am used to. It is also a testament to the fact that science DOES change! Here is a snapshot (British Journal of Dermatology, pp296-299, 1958). 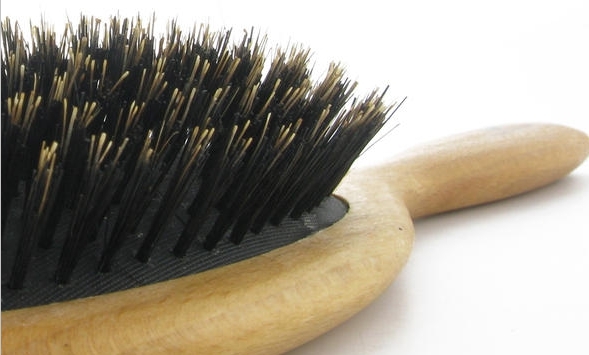 Have you used a boar bristle brush? Would you recommend it? I love this! Seems very common-sense. I ditched all of my brushes years ago. It really doesn't matter to me if my edges are frizzy or smooth---I'd rather have edges! Thanks for your amazing scientific approach as always JC! I have been using only a wooden comb on my hair for more than two decades, and have thought it not only stimulating enough for my scalp but also a saving grace regarding breakage and split ends. The comb I've had all these years is made by Culpepper, consisting of the typical two gauges of teeth-size; so far I've found this the best brand -- but I don't think they are made any more, alas. There is a Youtuber with the channel "wateronlyhairwash" (https://www.youtube.com/channel/UCw0jjBA8eh8qWwFHGYjHNHA) who has long, full 4b hair and uses a boar bristle brush. Seeing her hair gave me the courage to re-try water only with a boar bristle brush. I have also read a bit about Aline Villandri, a French opera singer from back in the day with floor-length, full hair. She was an advocate of infrequent washing and regular brushing. I used a boar bristle brush just last week and so far, so good. I'm going to proceed with caution though. A cautionary tale here - Always remember, her hair is not your hair. I do not take hair typing seriously. I believe that experience is the best teacher. IF your hair breaks, brushing is out, if it doesn't then try it. Never ever think that just because your hair looks alike that it will behave in the same way. Use a boar brush thats soft and gentle vs something thats hard and stiff, it would be less damaging. I use boar brushes occasionally but the bristles are really soft. and gentle. I wouldnt use a nylon brush or anything hard and stiff . I occasionally use a boar bristle brush for smoothing edges, but I always soak the bristles in hot water first for a few minutes to soften them, then I dry the brush with a towel before using it. I too use a soft boar bristle brush occasionally to put my hair in a smooth style such as a puff, bun or updo. I don't understand why the hard boar bristle brushes exist. It just screams PAIN!